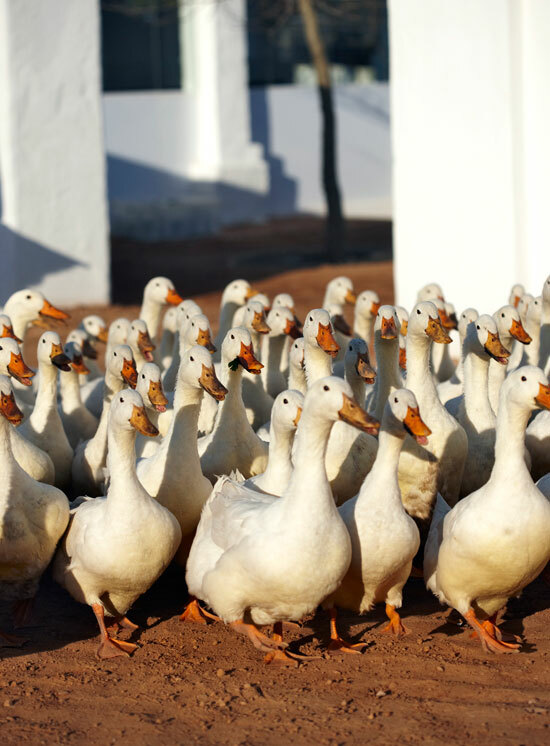 Visitors to Babylonstoren need to prepare themselves to possibly come across a herd of ducks during their visit. And yes, the collective noun for ducks is ‘flock’, but see this lot heading towards you between a row of vines, and you’ll think ‘herd’ too. Every morning, the 200-odd clean, white Pekin Ducks leave their pen in the formal garden, and make their waddling way down to the orchards and vineyards on the farm, off for their day’s work. They’re very well-behaved, staying together all day, and never crossing a road until their keeper gives them the signal. Their purpose is not just to charm visitors, but to feast all day long on their favourite food: snails, with a side dish of mixed insects, keeping our vines pest free. So it’s true: everyone does eat well at Babylonstoren!